This dish—roast chicken on a bed of warm bread salad with wilted arugula, pine nuts, and currants—is the best known creation of San Francisco's famed Zuni Cafe. 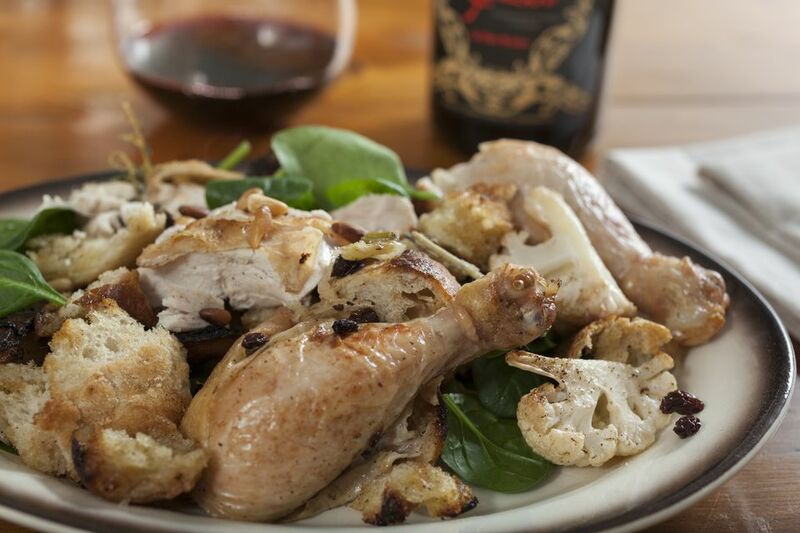 This version uses my favorite Roasted Chicken recipe, increases the bread and arugula ratio, and features sherry vinegar. It's a flexible recipe. Try a different vinegar, use green onions in place of the garlic, add chiles, use walnuts—whatever strikes your fancy. You can use a store-bought rotisserie chicken to make this dish, but the lack of ample pan juices will detract from the flavor and you may need to add more olive oil to moisten the bread. Use your fingers to loosen the skin from the meat on the breasts and thighs of the chicken. Measure out 1/2 teaspon salt per pound of chicken (i.e. a 4-pound chicken will need 2 teaspoons salt). Rub the salt all over the chicken, including under the loosened skin. Set the chicken breast-side up in a roasting pan and chill at least 2 and up to 36 hours. Bring the chicken to room temperature and preheat oven to 400°F. Rub the breasts and the top of the thighs of the chicken with the butter. Pour the wine or broth into bottom of the pan. Roast the chicken, undisturbed, until browned, about 45 minutes. Check occasionally and add more broth or water if pan looks dry. Meanwhile, cut the bread into 1/2-inch slices. Brush the slices liberally with olive oil. Grill or broil the bread until grill-marked or toasted on both sides. Cut the bread into bite-size cubes and set aside in a large bowl. Reduce oven heat to 325°F, spoon some of the pan juices over the chicken (add more broth or water if pan is dry), and continue roasting until the meat pulls away from ends of drumsticks and the thigh joints feel loose and move easily when you wiggle the end of a drumstick, about 30 minutes (cooking times for chicken vary greatly depending on size, temperature going into the oven, and precision of oven temperature, so go by how the chicken looks and feels, not the clock). Experienced chefs also know that a fully-roasted chicken makes a slight hissing whistle or "singing" sound. Meanwhile, heat 1 teaspoon of olive oil in a small frying pan over medium high heat. Add the garlic and currants. Cook, stirring, until fragrant, about 1 minute. Add the vinegar, bring to a boil, and drizzle evenly over the reserved bread cubes. Quickly toss everything to combine. Return the frying pan to the heat and toast the pine nuts, about 30 seconds. Add them to the bread and toss to combine. Transfer the chicken to a large cutting board. Put the bread mixture in the roasting pan, tossing to combine the bread with the pan juices from the chicken, and put the bread in the oven. Let the chicken sit for at least 10 minutes. Cut out the back bone, halve the chicken down the center of the breast bone, cut off the legs and separate the thighs and the drumsticks, separate the wings from the breasts, cut the breast halves in half. You will have 8 pieces of chicken (not including the back). Remove the bread mixture from the oven. Toss the bread with the arugula until the leaves wilt. Add black pepper to taste. Put the bread salad in a serving dish or on a platter and arrange the chicken pieces on top or around the salad. Serve hot or warm.